Councilman O’Connell must spoke to me a lot about how long he thought he had to live after a accident that led to a stay in the hospital. He also knew that the work of advocating for the people and calling out wrongs came at a cost. Like any advocate worth their salt they stocked away information and resources in the event that they were unable to expose it themselves that the information still got out. 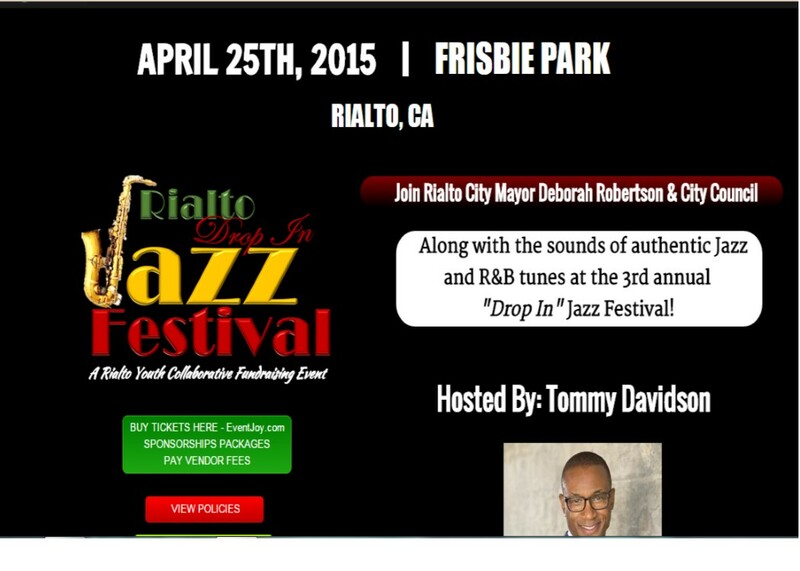 Well in the case of Rialto Mayor Deborah Robertson and her Jazz Fest Such information has been made available. Below you will see a letter from Councilman O’Connell that will make you wonder why the Mayor would try to hold yet another event using the resources of yet another non profit. As elected officials we have an ethical responsibility to bring to the attention of our colleagues and our constituents any acts that are perceived to be in violation of our City policies, ordinances or State Law. We must do so even if it would be harmful to ourselves, or not in our best interests to do so. We do not have the luxury as elected officials of looking the other way or pretending it didn’t happen. This letter is intended to inform the City Council of the potential misuse of city funds and personnel and to seek guidance on how to proceed. As such, it this letter has been distributed to Mayor Deborah Robertson, Mayor Pro Tem Joe Baca Jr., Councilman Ed Scott, City Administrator Mike Story, and City Attorney Fred Galante. Please place this on the February 9, 2016 city council agenda to be discussed in closed session regarding legal issues and personnel. At the City Council meeting of 3/10/15, Financial Director George Harris provided a presentation for the Council regarding an upcoming Jazz Fest scheduled for April 2015. During the presentation, Director Harris stated that the event was not a city related event. 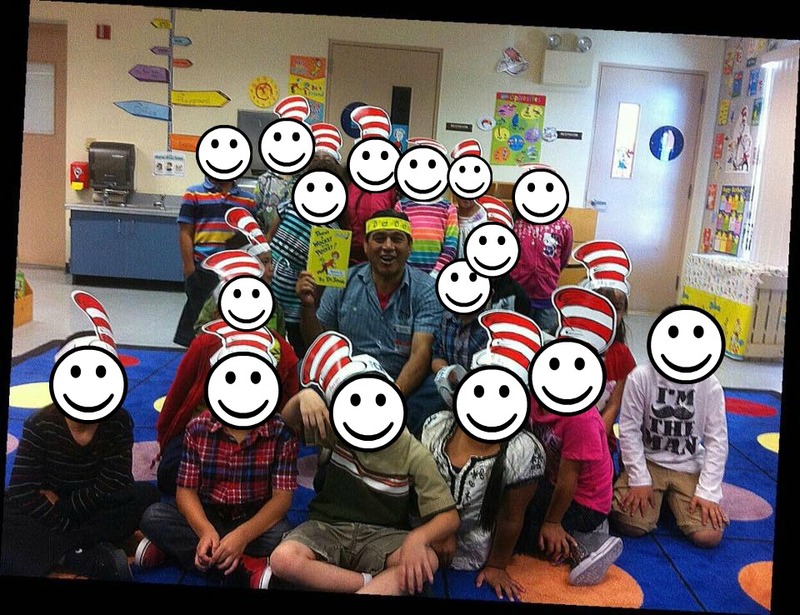 It was a private event hosted by the Rialto Youth Collaborative, a non profit 501 c3 which he oversaw. Director Harris stated that they had sold approximately 100 tickets, with an additional 300 tickets reserved. According to Director Harris, they needed to sell anywhere from 3000 to 3500 tickets to make enough money for this event to be successful. Otherwise he planned on canceling the event. A few weeks later, during an organizational meeting for this event with the principals involved, we are informed that Director Harris attempted to cancel the Jazz Fest by telling Mayor Robertson that he was going to cancel the event due to the lack of sales. It’s not clear why Mayor Robertson was even participating in this event (and previous meetings) but we have been informed that at that meeting she told him no and instructed him to continue forward. At no time was this a City of Rialto event and Mayor Robertson, as a City official, did not have the authority to tell Director Harris to continue with this event. Based on that directive, Director Harris continued forward holding the event in April. The event was a total loss, eventually selling only the original 400 tickets according to Director Harris. According to Director Harris, the final result ended in a $30,000 loss for the charitable organization the Rialto Youth Collaborative, an outstanding bill to a contractor of $6,000.00, and an approximate $40,000 unpaid bill owed to the City of Rialto. It is this $40,000 that we as elected officials are responsible to account to our constituents. At no time was Director Harris given the authority by the City Council to spend this $40,000, nor could anyone else have authorized the use of City personnel or property because it would require council approval. 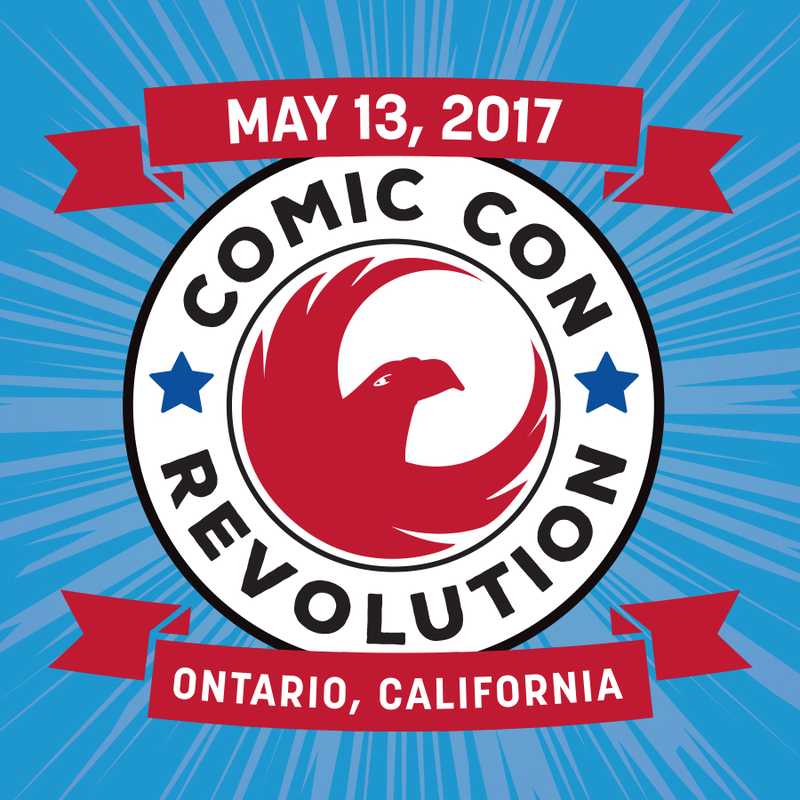 During the public presentation on 3/10/15, Director Harris clearly stated he would need to sell at least 3,000 tickets to cover the event. He also stated he would pull the event in case he didn’t reach the required tickets sold. Apparently he tried to cancel the event but when he was told no by Mayor Robertson, his only hope was to sell the 2,600 tickets on the day of the event itself to prevent a total loss. He did so by gambling city assets that he had no direct authority to use. Also, during meetings with Mike Story, Director Harris was told by members of the City Council and Mike Story to immediately stop using city resources & employees to support this event. He was directed to remove the City Seal, discontinue using city telephone numbers and staff to sell tickets, etc. Director Harris did the opposite, even though he stated that he fully understood the direction of the Council. He continued advertising on city property, using city personnel to sell tickets over the phone and on city property. 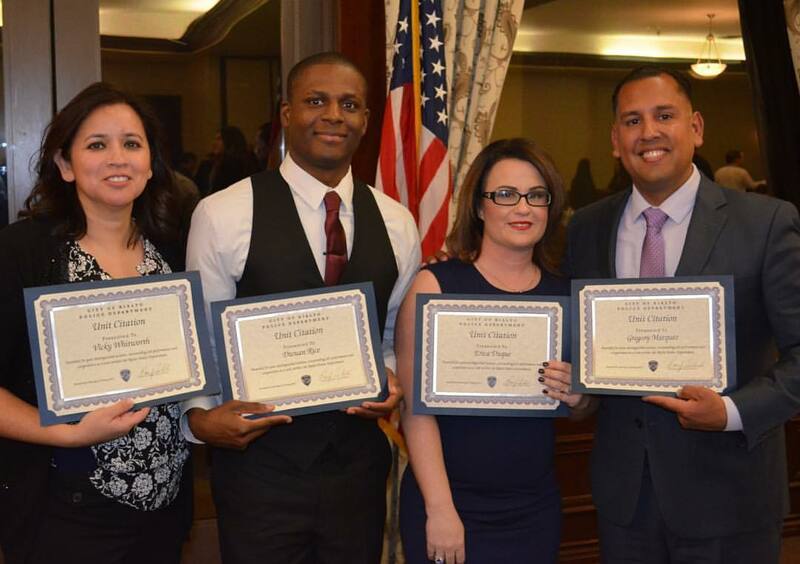 As elected officials for the City of Rialto, we are entrusted with the duty to ensure that all assets of the City are used in a legal and transparent manner. Regardless of the amount spent, the fact that it was city funds and spent in direct opposition to the direction of this City Council makes this a serious issue. Additionally, based on Director Harris’s statement that he decided to use city funds because he was underwater in the event and that was the only way to attempt to make his money back. This logic shows a reckless and potential illegal use of city funds and resources. Based on the information received that Mayor Robertson had a direct involvement with this Jazz event, her attending numerous meetings of this event, and her directing Director Harris to continue when he attempted to stop the event (regardless of its impact), it would appear that she was not impartial to its final outcome regardless of the impact it might have on this city. Based on this involvement, it is respectfully requested that she excuse herself from any deliberation on this matter. Earlier this week our offices received a letter that is addressed to Rialto Police Chief Randy Deanda, Mike story and city of Rialto. This letter goes into detail about the knowledge of the city of Rialto approving the work done on the K-9 obstacle course and yard. 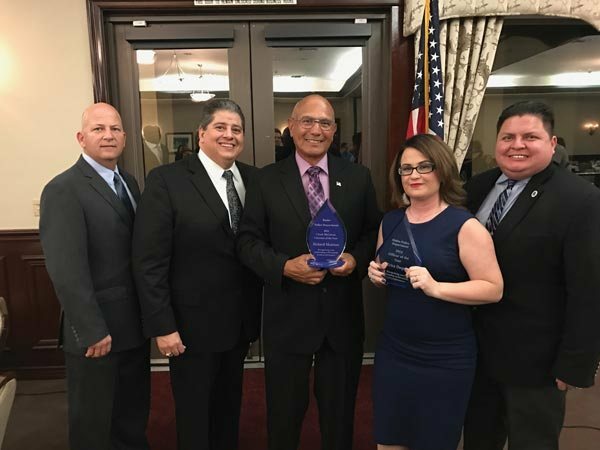 It also goes into detail about an interaction with our police chief and the president and founder of friends of the Rialto Police K-9 Association. The letter details a complaint where Chief Randy Deanda banged on Greta Hodges door and personally delivered a letter stating that the friends of the Rialto Police canines were no longer to be involved with Rialto Police canines the letter also stated that Randy Deanda had spoken to Rialto city council members and that they all agreed with the chief on this decision the letter also goes into the fact that Chief Deanda apparently brought a witness with him Captain Wilson from the police department to verify that he delivered the letter. 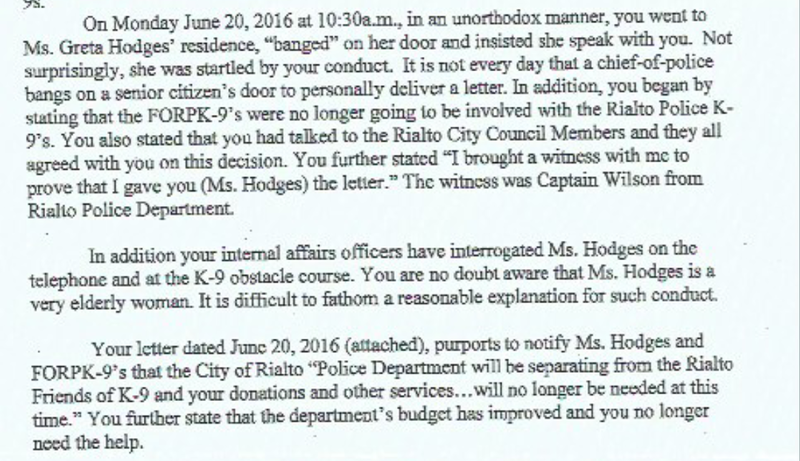 The letter details that Chief Deanda opened a internal affairs investigation and officers interrogated Greta Hodges founder of The Freinds of Rialto Police K9 on the telephone and at the canine obstacle course the letter states. As of June 20th 2016 the police department no longer need the services of the friends of the Rialto Police canines a group that has funded canine operations in the city of Rialto for decades. It’s hard to Fathom with a basically cash balance budget that we would be in a position to start funding K9 purchases and operations when there’s a non-profit organization willing to do the work and provide the funding. It’s also odd that a police chief can by himself without any written Authority from city council mayor or the city administrator tear up or sever ties with an organization like this. The letter also states that Chief Deanda said that the Police Departments budget has approved and they no longer need the help of the Friends of Rialto Police K9’s. This is confusing as Rialto is looking at yet another extension of the Utility Users Tax or the creation of a Public Safety tax to provide police services. Another point of reference that the letter spells out is the way that the Chief’s actions have hurt the Friends of Rialto Police K9 with other officers, vendors, donors and the city leadership. This action by Chief Denada has created what some say an unnecessary division among the Friends and the Police Department. From what we can surmise is that this all began with whatever issues lye between Chief Deanda and Former K9 officer Glen Anderson who was fired last month after a lengthy IA investigation. Another victim of this situation is former officer Glen Anderson’s K9 partner Jordy who has been stored at the Alderhorst training facility for almost a year now. 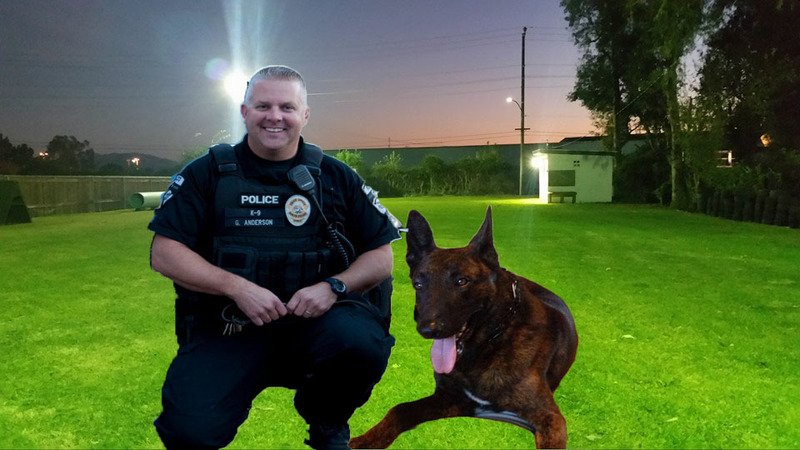 It is very concerning for some in the community and The Friend’s of Rialto Police K9 that this powerful skilled dog has been allowed to be an additional victim of this sad series of actions. We looked further into the authority of the Chief to be able to cut ties with this organization and it appears it is up to him but it is odd that this type of decision would not be made public.